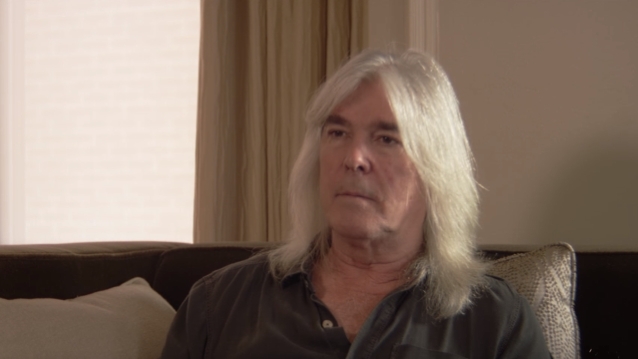 Share the post "Newly Uncovered Photo Appears To Confirm CLIFF WILLIAMS’s Return To AC/DC"
Photographic evidence has emerged suggesting that bassist Cliff Williams is part of the rumored AC/DC comeback album which is expected to be released in the coming months. Last August, singer Brian Johnson and drummer Phil Rudd, along with guitarists Angus Young and Stevie Young, were photographed outside Vancouver’s Warehouse Studios. Based on the pictures, the assumption at the time was that AC/DC was in the midst of making — or at least planning — another album, with Rudd and Johnson both back in the lineup. Williams, who announced his retirement from AC/DC more than two years ago, wasn’t seen in any of the photos from the Warehouse, leading many fans to speculate that he was not involved in the band’s latest recording sessions. But a newly uncovered photo posted on the Instagram account of Canadian personal trainer Scott Frinskie places Williams and Johnson together at a Vancouver hotel while the studio sessions were taking place. The picture, which can be seen below, appears to have been taken at the Shangri-La Hotel around the same time — September 2018 — that Johnson recorded a video message congratulating Canadian rockers HEADSTONES on the 25th anniversary of their critically acclaimed debut album, “Picture Of Health”. When Williams confirmed his retirement in an emotional video following the end of the group’s “Rock Or Bust” world tour, he stated that it was “time” for him “to step out.” His decision followed a string of personnel changes for the group that started with co-founding guitarist Malcolm Young‘s departure in 2014 after he was diagnosed with dementia. In 2015, Rudd was sentenced to house arrest after he was found guilty on a drug charge, while in early 2016, Johnson was forced to step down or face the loss of his hearing. While Cliff acknowledged the numerous changes that the band had undergone in recent years, he noted AC/DC has been dealing with such tumult since the death of singer Bon Scott. Ever since AC/DC completed the tour cycle for its 2014 album “Rock Or Bust”, fans have wondered whether sole remaining founding member Angus Young would keep the band going or decide it was time for AC/DC to pack it in. Johnson left AC/DC mid-tour and was eventually replaced on the road by GUNS N’ ROSES frontman Axl Rose.